MOSCOW, Idaho – With a good, old-fashioned quarterback competition going on at Idaho, why wouldn’t David Ungerer throw his hat in the ring? The senior receiver lined up in the backfield during Wednesday’s practice, took a wide pitch from Mason Petrino and launched a 40-yard rainbow to Jeff Cotton streaking past the secondary. “We would never do this in a game,” Vandals coach Paul Petrino said afterward, grinning. Ungerer’s contribution aside, the Vandals have mostly relied on junior Mason Petrino and sophomore Colton Richardson to get the ball downfield, with freshman Nikhil Nayer making an occasional cameo appearance. Nayer got more work Wednesday when Richardson missed practice with an ankle injury that Paul Petrino says is of no long-term concern. Whoever takes snaps for Idaho will have Ungerer and Kaden Elliss as veteran targets. But most of Idaho’s receivers are newcomers like Cotton, a redshirt junior, and D.J. 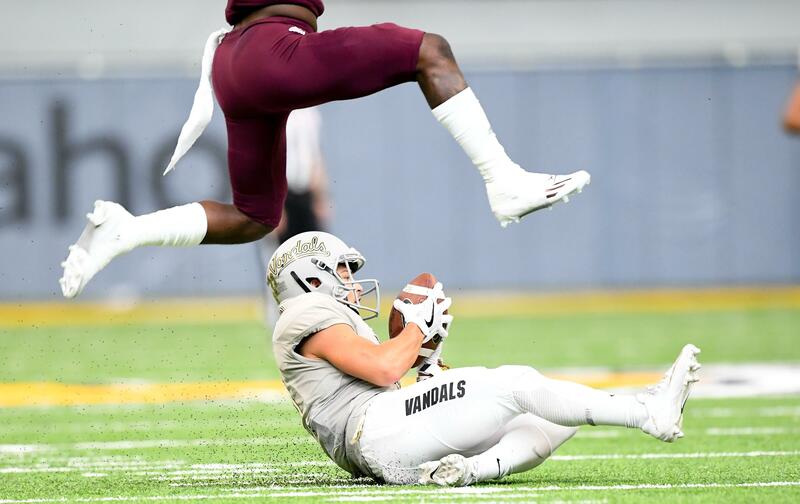 Lee, a redshirt freshman, whose next catches for the Vandals will be their first in a real game – although they were standouts in the spring. “Me, Jeff and some others are still processing the offense and understanding the coverages,” according to Lee. He and Mason Petrino have already connected on a pair of sliding receptions where Petrino led him away from a defender. Paul Petrino singled out Cotton and Lee, junior Fernand Steavenson, redshirt freshman Cutrell Haywood and redshirt sophomore Brandon Luckett as pass catchers who have made themselves noticed the first week of practice. Cotton, at 6-foot-2, 204, is a sizable target either playing outside or in the slot, and Lee is an example of Paul Petrino’s intent to build speed in his team, even if it is scavenged from another position. Because Idaho was loaded with seniors on offense last year, the quarterbacks and most of the receivers who will be expected to carry the load this year received plenty of practice repetitions with each other as reserves. Thus Cotton and Lee are well acquainted with Mason Petrino and Richardson’s respective characteristics. “Mason gets out of the pocket and can extend the play. Colton is a pocket passer,” Cotton said. Richardson has the more powerful arm. “As receivers, we’ve just got to adjust to the ball,” Cotton said. It is an incremental process likely to continue at least until Idaho kicks off its season at Fresno State on Sept. 1, and probably beyond. Cotton may have earned Paul Petrino’s favorable attention for making the most of practice opportunities, but he is waiting impatiently for the real thing to begin. A redshirt season is behind him and it doesn’t matter who is throwing passes for him to chase down – Mason Petrino, Richardson or even Ungerer. “I can’t wait to get back in front of a crowd,” he said. Published: Aug. 8, 2018, 4:12 p.m. Updated: Aug. 8, 2018, 7:09 p.m.